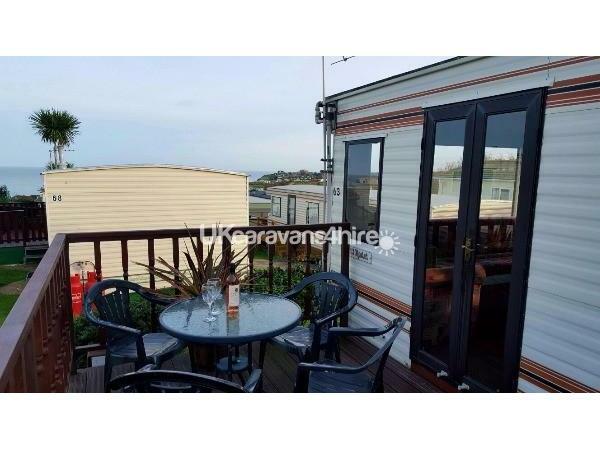 Additional Info: 4 Berth Holiday Caravan with stunning sea views to rent, with large outside decking area, patio table and 4 chairs. Great for families with children of all ages or couples looking for a relaxing break. 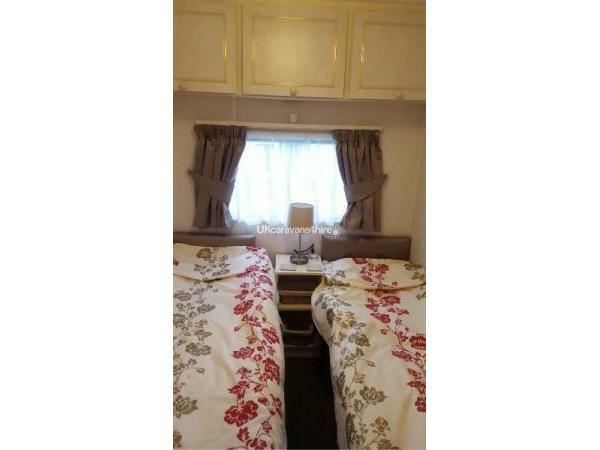 2 Bedrooms, (1 Double Bed, 1 full size single bed, small single bed ) warm air heating in both bedrooms and bathroom. Ample Storage. Hairdryer in double bedroom. 1 Bathroom, shower, sink, toilet. Living Room with large seating area, Dining area with seating for 5-6 persons. Freeview TV/DVD. Modern Electric Fire, Independent heater, Selection of Family Games/DVD's/Books. 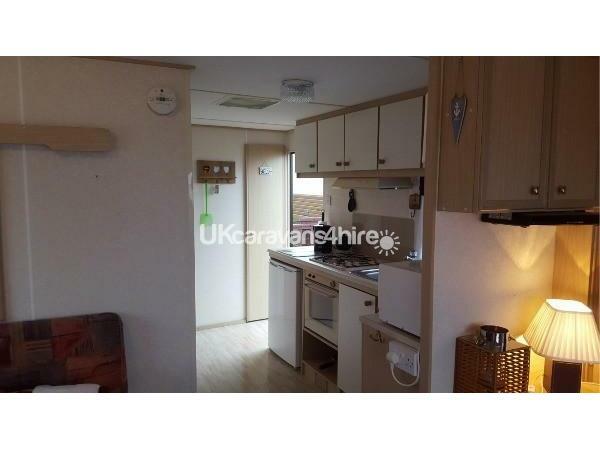 Fully equipped kitchen with gas oven (gas is included in hire price) fridge/freezer box, microwave/toaster etc. 20 units of electricity is preloaded further cards are available to purchase at reception. 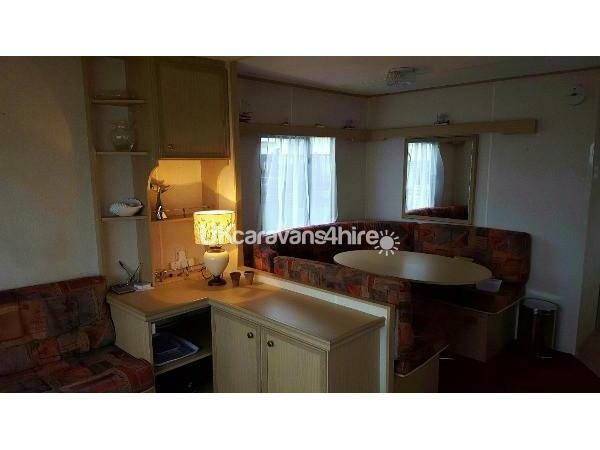 Private parking space outside the Caravan. Storage box outside with buckets, spades, windbreaker, garden seat cushions etc. Beautiful Sea and rural views from lounge and large outside decking area perfect for alfresco dinning. All bed linen/tea towels provided, please bring your own towels/beach towels. A non-refundable Deposit of £50.00 is required at time of booking. Payment is due 4 weeks before start date. 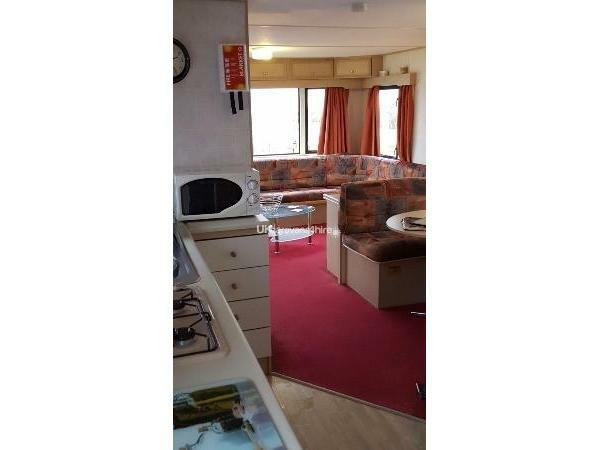 4 Berth Holiday Caravan with stunning sea views to rent, with large outside decking area, patio table and 4 chairs. Great for families with children of all ages or couples looking for a relaxing break. 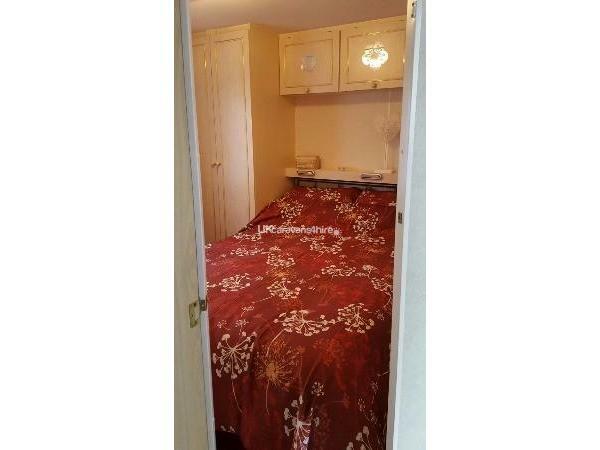 2 Bedrooms, (1 Double Bed, 2 single bed, ) warm air heating in both bedrooms and bathroom. Ample Storage. Hairdryer in double bedroom. 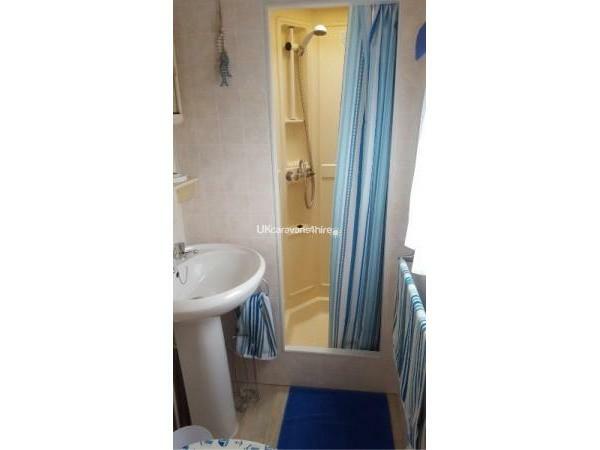 1 Bathroom, shower, sink, toilet. Living Room with large seating area, Dining area with seating for 5-6 persons. Freeview TV/DVD. Modern Electric Fire, Independent heaters, Selection of Family Games/DVD's/Books. 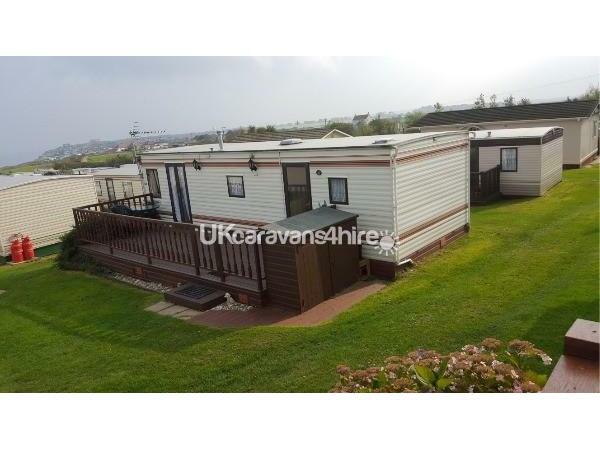 The caravan is in a great location on a brilliant site with all facilities including Club House, heated outdoor Swimming Pool, ( Pool opens in Mid May - Sept ) ) Children's pool with small slide is perfect for under five's, Games Room, Shop, Café serves all day breakfast/snack bar throughout the day by the pool. BBQ evenings by the club house in the summer months, just a 10-15 walk to the local beautiful natural sandy beach or just a few minutes by car. A bus service runs from the entrance of the caravan park to the surrounding towns and villages. 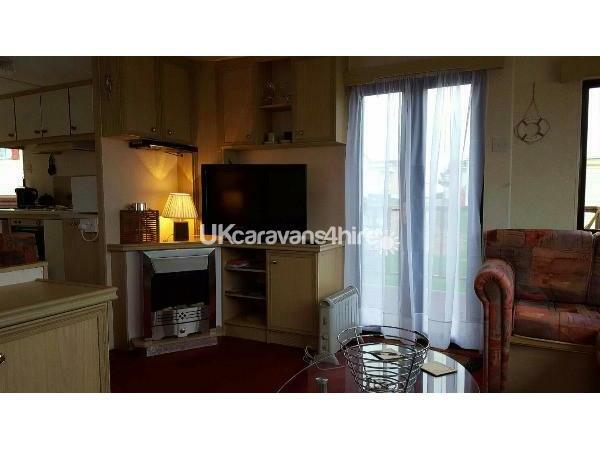 Perfect location for coastal walks or a relaxing family break. TRIMINGHAM near CROMER on the NORTH NORFOLK coast is a lovely area for old and young alike, near to the village of Mundesley with its crazy golf course (great for families). Mundesley has a Tesco store, there is a good choice of takeaways, pubs ( the Ship Inn a great place to eat) and local shops in this charming village. 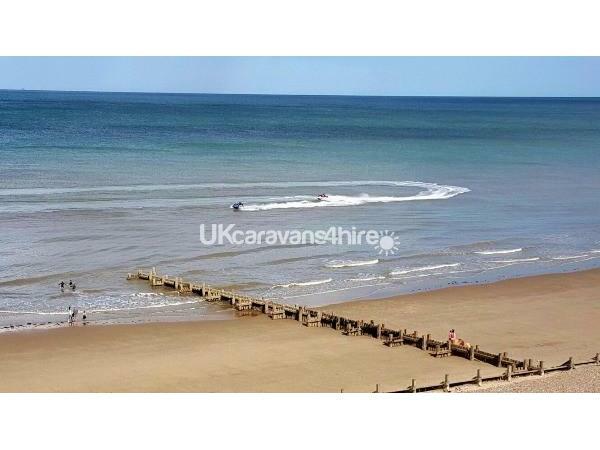 The village of Overstrand 2.5 miles with the beautiful Sea Marge hotel ideal for afternoon cream teas. For Food lovers enjoy a great meal at the Foundary Arms in Northrepps, and don't forget to sample the famous Cromer crab and lobster. The Victorian seaside town of Cromer is only a 10 minute drive away and offers shops, restaurants, pier with theatre, pubs, supermarket, museums, cinema, amusements, train and bus station. August they host a spectacular Carnival week make your way to the pier to watch the firework display fun for all. 2 links Golf course with in 15-30 minutes drive from the site. Fishing at Gimmingham Lake is just 2miles away. Sheringham 11 miles is a lovely seaside town which has a 40s weekend focused around the Steam Railway in September (not to be missed ) and a little further north around the coast are the villages of Well-next-the sea voted the best beach in Britain. Cley with its famous windmill and bird reserve to name just a few, to the south . Great Yarmouth with all its facilities is 30 miles. slightly inland (20 Minutes) )is Wroxham a well known boating attraction on the Norfolk broads. The Historic City of Norwich is within easy reach. North Norfolk is a birdwatchers Paradise with is rolling countryside and spectacular coastline, miles of glorious beaches and picturesque Market Towns and villages, The Village of Blakeney and its famous boat trips to see the seals and a spot of bird watching is a must. Within the local area there are nature tours, walks, gardens, theme parks, zoo's and adventure trails for children. The North Norfolk Railway (poppy Line) begins in Holt a splendid market town with all facilities and ends in Sherringham a lovely scenic tour. Vehicles are parked & left at owners own risk. 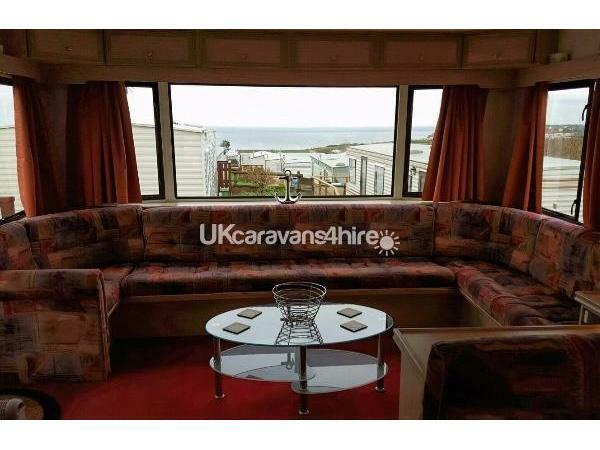 The owners will not be held responsible for any injury to any member of the party or any loss, damage or theft of personal effects in the caravan on the site. Additional Info: Membership is not required. Outdoor Heated Swimming Pool, with Children's Pool and slide, ideal for children under 5 years of age. ( Pool opens in Mid May-Sept) .On-site Café serves all day breakfast and pool side 'takeaway/snack bar. Club House with entertainment at weekends for Adults and Children in the summer months. A full programme of entertainment with Children's entertainer on generally Wednesday and Sundays in the summer months. No reviews found. 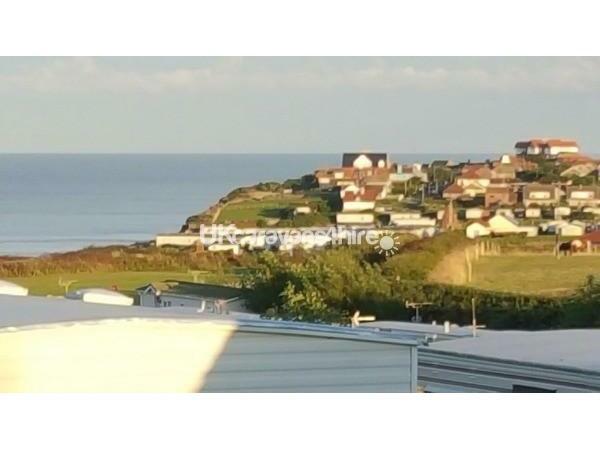 If you have recently stayed in this holiday home please leave a review, it only takes a few moments and will really help future guests when they are searching for holiday accommodation at Trimingham House Caravan Park.